We’d love your help. 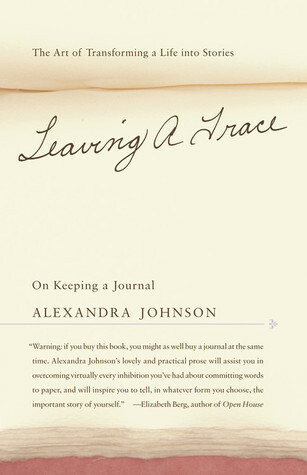 Let us know what’s wrong with this preview of Leaving a Trace by Alexandra Johnson. Now in paperback comes the acclaimed, one-of-a-kind practical guide to starting and keeping a journal and transforming it into a larger creative work: a family chronicle, a memoir, or a novel. To ask other readers questions about Leaving a Trace, please sign up. super enjoyable. and i did some of the exercises as i went through the book, which is always a good sign. i definitely recommend if you're looking for a book to get you away from the shame-spiral of introspective whining in your journaling. a book i will return to again and again. Very good book about keeping a journal or diary, with writing exercises (some of which I tried and was pleasantly surprised by) and excerpts of what writers noted for journaling and memoir writing had to say about how the process enhanced their lives. Notes the author, "Successful journals break the deadlock of introspective obsession." Yes, that. That's what I aspire to. When I picked this book up on the "value" shelf at Barnes and Noble I expected it to be a cheezie "how to dig into your soul and find who you are" self help writing book. So now years later I truly can not remember why I actually bought it. Perhaps its 3 dollar price ticket had something to do with it. It is a fast and informative read. Covering subjects regarding journals; the importance of them, how to go about keeping one and the journals of the past that have impacted the future of others. W When I picked this book up on the "value" shelf at Barnes and Noble I expected it to be a cheezie "how to dig into your soul and find who you are" self help writing book. So now years later I truly can not remember why I actually bought it. Perhaps its 3 dollar price ticket had something to do with it. It is a fast and informative read. Covering subjects regarding journals; the importance of them, how to go about keeping one and the journals of the past that have impacted the future of others. What I liked about "Leaving a Trace" was how many memoirs she used for examples through out the book. I love Journals, writing, and journal writing. This book is excellent, and it really lent depth and breadth to my writing. I strongly recommend it to anyone and everyone. I find that reading books about writing gives me fuel for my enthusiasm to write myself. This book really motivated me and gave me tons of new ideas to write about. Most writers say that if you want to be a writer then you need to write every day. This book really encouraged me to do that. I need to re-read it soon. This book is for those who want to become more serious with journal keeping and possibly use it for further creative work. I enjoyed the challenge and intellectual approach to journaling. It has stretched me to use my journal in a deeper way. There are so many writing resources available that it's hard to select the best for our time budget but I feel that this one is worth the time. One of the best books on journaling I've read. There are segments of it that are particularly interesting and useful for writing more than journals. I really liked this book a lot and took a lot of notes. *تنبيه : ذكرت إشارات وإفادات من الكتاب ومن غيره استفدتها لأن الكتاب في علمي لم يترجم ، راجياً من الله أن ينتفع القارئ ويأخذ لمحة عن هذا الفن الجميل. تصفحت الكتاب وقرأت جملة صالحة منه وراعني ما فيه من كثرة الأفكار والتقنيات والتدريبات في موضوع journaling ولا أدري ما هو المسمى المصطلح عليه في العربية هل هو المفكرة أو المذكرة أو التعليقة أو المدونة أو الذكريات؟ فكلها تصلح ولكن قومنا لم يعنوا كثيرا بهذا الفن على جلالة قدره وفائدته النفسية والاجتماعية والأدبية. كان أول ما نبهني إليه كلمة للطنطاوي-رحمه *تنبيه : ذكرت إشارات وإفادات من الكتاب ومن غيره استفدتها لأن الكتاب في علمي لم يترجم ، راجياً من الله أن ينتفع القارئ ويأخذ لمحة عن هذا الفن الجميل. كان أول ما نبهني إليه كلمة للطنطاوي-رحمه الله-قرأتها في بداية ذكرياته الحافلة -قديماً-يندم فيها ويتألم لما فاته منها وحتى التي يذكرها فهو يرويها بعقل الشيخ الكهل فكأنه يقص عن رجل غيره وحتى المشاعر ليست المشاعر فالشاب الغر الذي شارف على الموت قريبا كلماته وحروفه مختلفة عن التي يحكيها بعد أربعين سنة. وكان يقول أنصح كل شخص أن يكتب ما جرى له في يومه لا أن يكتب قمت الصباح وفرشت أسناني بل يكتب شعوره وما زاد في نفسه ونقص وأزيد ومن لقي ومن استفاد منه ومن كره ومن أحب وما سمع من مجتمعه لا سيما كبار السن الذين تموت بموتهم كثير من الثقافة والذكريات والأدب. فلما تفكرت في نصيحة هذا الأديب المجرب بدأت أبحث عن هذا الفن ولم أجد شيئاً باللغة العربية إلا دروساً غثيثة عن الكتابة والإنشاء ، ثم وجدت كتبا إنجليزية كثيرة جدا وعرفت بعدها أنه فن قائم عندهم فقرأت وتصفحت بعض الكتب منها هذا ويا ليت بعض الدور تترجم الجيد منها أو يقوم أحد من قومنا بتأليف كتاب فيه ولا أشك أن في الناس من يكتب لنفسه وللأسف فهذا الفن خامد عندنا. أعتذز عن الاستطراد ولكن هذي خواطر عنت فسودت بها هذه الصفحة لعل أحد يستفيد منها أو أستفيد منها أنا بعد حين :) وهذا مما استفدته من هذه الكتب ويسمونها الكتابة الحرة وبعضهم يتطرف فيضع أسلوباً كتابياً يسمونه التنفيس (cartharsis)يُحض فيه على أن يضع الشخص قلمه على الورق فيكتب ما يمر في ذهنه من كلمات حتى لو لم يربطها رابط نحوي أو منطقي وهي أشبه بالهذر لكن بعد ما ينتهي من الكتابة سيجد كلمات متراصة غريبة عن بعضها ولكن لو قرأها بتمعن وتفكر تظهر له أشياء من عقله الباطن لم يحسب لها حساب. المهم أن الكتاب له طريقة مختلفة قليلاً عن الكتب التعليمية التي رأيتها من قبل وفيه شيء من اللخبطة فترى نصائحه وتقنياته منثورة بين اقتباساته وهذا مما شوه ذهني قليلاً ولعل هذا لضعف لغتي الانجليزية. في الجزء الأول من الكتاب يركز على كتابة المذكرات وأنواعها وأشكالها وطرقها ثم في الجزء الثاتي يركز على إيجاد الأنماط في حياتك وشخصك فيما كتبت والمعاني المستترة الكامنة التي تغفل عنها في خضم هذه الحياة العاصفة الهوجاء وهذا من أهم ثمرات الكتابة وأعرف من تفاجأ من نفسه كأن روحه في جسده خلق آخر ! وفي الجزء الثالث ركز على كيفية إخراج هذه المذكرات إلى النشر والمطابع على هيئة السير والمذكرات الشخصية وكيف تنخل ما كتبت ليكون صالحاً لهذا الغرض. I don't rate books by people I know -- too complicated. But while Johnson's book is a treatise on journaling - why, how, forms, what can be gleaned or developed from them, etc. it had a surprising effect on me--I picked up my journal after not touching it for two years. Among other things, it was revelatory to look back and discover that apparently I've never been happy working for someone else. The book also inspired me to return to an awareness of my surroundings and the people that make up th I don't rate books by people I know -- too complicated. But while Johnson's book is a treatise on journaling - why, how, forms, what can be gleaned or developed from them, etc. it had a surprising effect on me--I picked up my journal after not touching it for two years. Among other things, it was revelatory to look back and discover that apparently I've never been happy working for someone else. The book also inspired me to return to an awareness of my surroundings and the people that make up the background of daily life, to take notes and do character sketches. I picked this up out of curiosity after having worked with the author. There was nothing factual I didn't already know, but I never expect to be inspired and re-charged - that was a bonus. Alexandra Johnson has built an academic career studying diaries, of the famous and the ordinary, and she's extended that study to writing about the craft and practice of journalling. I so enjoyed this book--dipping in and out over the course of the past 6 or 8 months. It's a book best enjoyed and savored slowly, the way I do a perfectly brewed coffee. I'll keep this close by in my bookshelves, so I can continue to revisit and revise. I found this to be a fascinating, practical, inspiring examination of journal writing and of transforming journal into creative works. I took copious notes, wrote lists of memoirs I should read and was spurred on in my own writing. It might not interest everyone but I loved it. Glad I picked it up on a whim on one library visit. Each of us have an infinite arsenal of writing material to wield at our own discretion. Whether we recognize it or not, every moment that passes is crammed with writerly inspiration, and the onus is on us to seize this fodder and alchemize it into art. Alexandra Johnson's Leaving a Trace: On Keeping a Journal, The Art of Transforming a Life into Stories shows us exactly how to do this. I first read her work probably ten years ago. Her book The Hidden Writer: Diaries and the Creative Life is wond Each of us have an infinite arsenal of writing material to wield at our own discretion. Whether we recognize it or not, every moment that passes is crammed with writerly inspiration, and the onus is on us to seize this fodder and alchemize it into art. Alexandra Johnson's Leaving a Trace: On Keeping a Journal, The Art of Transforming a Life into Stories shows us exactly how to do this. I first read her work probably ten years ago. Her book The Hidden Writer: Diaries and the Creative Life is wonderfully inspiring, covering the diaries from the likes of Katherine Mansfield, Sonya Tolstoy, Virginia Woolf, Alice James, and Dorothy Wordsworth along with other luminary voices. These stories, journal passages, and diary excerpts have haunted me since as each artist silently battles with the written word in the shadows of their more renown male counterparts. Leaving a Trace coaxes us to follow these brilliant writers and diarists. Filled with practical exercises and useful guidelines, Johnson leads us through the mire of our own life and lights a clear-cut path, so that we may view ourselves objectively and weave stories from the chaos of experience. Taking advantage of the clarity of hindsight and encouraging us to exploit our confusions, wrest with our fears, and tackle our struggles head-on, Johnson thankfully doesn't dip into self-help or spout quasi-therapeutic mantras, which so often render writing books useless and impractical for the working writer. Her goal is fixed, professionally and artistically devoted to the craft of writing though readers do not have to be professional or emerging writers to adopt her practices. All of her exercises aim to shape a wonderful lens for our inner selves whether we're dabbling or committed. From "Chapter III: Ways of Seeing the Present-Tense World"
Lists limber the mind, focus its material, tap deep into the unconscious, finding its hidden interests. I often make them when I've got a cold. It clears the head immediately. Make three columns. In the first column, randomly list ten separate years in your life. Next, ten places. Last, ten people. Without stopping to think, go across the columns, circling four key items in each category. Make columns from just those. Now select one in each column and put them in a final list. That's where you begin. In front of you is a master list, some code of memory, you've given yourself to decode. Trust your instincts. Your hand, like a magnet, simply found what I call the hot spots in the details. Write quickly to know why these three items won out. If you're just beginning a journal, which of three memories would you never forgive yourself for not setting down? (78). From "Chapter X: Living to Tell the Tale: Writing about Others"
Johnson gives real life examples from students and fellow writers she's worked with and been inspired by and stitches quotes from the heavyweights as well. Her book is well-organized into three units that first introduce us on how to start becoming more aware of our life experiences then shows us how to dig deeper into the past, and finally, instructs us how to deal with real life delicate matters such as staying mindful and respectful of our loved and close ones by morphing identities, characteristics, and physical attributes. Providing effective strategies to gain objective perspectives on the personal. Sometimes these methods can be daunting, like archiving and indexing your journals, but all of her suggestions are entirely reasonable and useful with the sole intent of reflecting over our relationships, our private moments, and our daily routines. She commands us to cannibalize our thoughts and turn them into artful narratives. This writing book is definitely a keeper. Writers will find this a necessary user's manual on how to constantly mine from within and never take for granted those fleeting moments that make us who we are. Nothing is sacred when it comes to writing. Its a free for all, and the story goes to whoever dares to seize it. This book honors questions we often ask ourselves such as, how do I keep a journal? And: what do I do with all the materials in the ones I have kept? As Virginia Woolf noted, the past urges us to leave a trace and we do that by keeping a journal. We take what we keep in journal and transform it into larger projects or writing. My diary is the missing link in the creative life. In the beginning, it was scribbling and venting. I wish she had stuck to who she is instead of imitating Virginia Woolf a This book honors questions we often ask ourselves such as, how do I keep a journal? And: what do I do with all the materials in the ones I have kept? As Virginia Woolf noted, the past urges us to leave a trace and we do that by keeping a journal. We take what we keep in journal and transform it into larger projects or writing. My diary is the missing link in the creative life. In the beginning, it was scribbling and venting. One of the better journaling books out there. Only two stars for a book on journaling? By me? Yes. This book is NOT what I thought it was going to be. I've read Johnson's other books on journaling - the history of it - and love them. Those books offer exactly what a potential buyer is made to believe by their blurbs. That is not the case with this book. The blurbs and recommendations suggest a book about how to write a journal - a book full of ideas on how to journal differently. You will find only very little of that. Instead this book almo Only two stars for a book on journaling? By me? The blurbs and recommendations suggest a book about how to write a journal - a book full of ideas on how to journal differently. You will find only very little of that. Instead this book almost wholly focuses on rereading your old journals to uncover untold stories or retell your old stories. The book is fanatic about finding your SELF in the stories you wrote down and in those that are missing. And as interesting as that can be, for an avid journaler who stacks finished journal upon finished journal that seems a little undoable. Who has the time?! Pensioners, maybe? Also, Johnson focuses on using your journals for writing a whole story...whether it is for your self as an afterthought, a re-defining of your Self or for a memoir or biography. I'm not sure how many journalers keep a journal to that purpose, really. None that I know, but then I've not yet reached the age where people might find a spark to? Except for the theme of this book being rather different from what I expected, I also find the book bulky in that Johnson keep repeating herself over and over. This book could have been half the size and then written in a more enjoyable way too. She continues to a point where I tossed the book aside, my patience used up. Yeah, yeah, I get it, you want me to reread and reframe my stories. That's what you've been saying over and over again in previous chapters already. When are you bringing on something new? And then it doesn't come. So about 50 pages before the end, I've put it down. This book was meant to be inspiring. As an avid journaler I had hoped and expected it would offer me some new perspective on journal keeping. What I picked up from the book is a slight curiosity to reread my old journals and to try and keep a digital journal for a change - to see how I like that. But other than that, this book left me feeling tired about journaling. What if I didn't want to reframe my stories at all? Then this entire book was pretty much useless. Was I a bad journaler then? What struck me about the book is Johnsons adament persisence in reframing life stories as a way of intense self-therapy. She doesn't call it that anywhere, but that is exactly what her technique will lead to in many cases. There are no warnings anywhere in the book about uncovering told and untold stories whereas this kind of intense self-therapy comes with potential risks. I feel Johnson should have included a section about that. Also, she recommends rewriting your stories. I get that where it comes to completing a story with untold details. But nowhere did I read anything about truth. Our memory isn't a very reliable tool. Especially not when we reframe things. We will always color them with the purpose we have with our stories. In my view journaling is a rather honest activity...rather raw. Retelling seduces the writer to form stories that lose their connection with the original notes. Now, that is not a problem if you use your journal as a starting point for a novel, a biography or a memoir (as her other books show, published journals have always been rewritten en are therefore not the most reliable sources for finding untamed truth). But for those who are looking to deepen their journaling experience, sticking with the truth can be highly important. All in all what I feel what Johson has done in this book, is set up a frame to use your self as a character in novel and she has given all the tools to do so. There is nothing wrong with that, but the majority of journalers will not be looking to do so and will find greater inspiration in books who offer good ideas for journaling techniques and ample examples to demonstrate them. While this book seems more geared towards the serious would-be memoir writer, I also enjoyed its insights and tips. If I ever decide to plumb the depths of my old journals for good material, I’ll have more of an idea what to look for. This is a good guidebook for those who want some direction in writing in a diary or journal. Written by a professor of creative non fiction, this small volume is filled with practical advice for those who want simply to record the events in their lives to those who want to move on to publishing their memoirs. The book is divided into three parts. The first and second part discusses the practical considerations in writing a diary or journal and dispelling the notion that there is a right way to This is a good guidebook for those who want some direction in writing in a diary or journal. Written by a professor of creative non fiction, this small volume is filled with practical advice for those who want simply to record the events in their lives to those who want to move on to publishing their memoirs. The book is divided into three parts. The first and second part discusses the practical considerations in writing a diary or journal and dispelling the notion that there is a right way to journal, that there is a special notebook (preferable leather covered!) a special pen, and that a record must be kept every day. Simply put, Johnson encourages writers to move past the fancy notebooks and pens, to get busy and just write. Although she acknowledges the need for quiet, she also points out that there are many moments in a busy life that are available to the writer to record thoughts, feelings, and events. She also writes about the hidden censor in all of us, that dark voice behind us that whispers things in our ears that prevent us from moving forward, always disturbing the flow of words and challenging us to say the right thing and make our notations memorable. He is a black shadow that continually seems to be asking, “Is that good enough?” or “Can’t you say that better?” It is a battle we all face and Johnson helps us find ways to lose that censor. She also acknowledges that introspective thoughts that stream whining and complaining are common to the beginner but once acknowledged, the writer can learn to focus their observational skills to better unearth their inner life. She provides examples of dairies and journals from well known people as well as friends she has known to demonstrate her points. I found these fascinating and really liked these sections of the book. A journal can be anything the writer decides it will be and Johnson shows the reader how to make the journal what he needs it to be. She describes journals that meet particular needs such as travel journals, commonplace journals, gratitude journals, dream journals and nature journals. And although journals and diaries can simply be a recording of everyday events, Johnson encourages us to get past that and to search for patterns in our everyday life. She wants us to find something more, to come to terms with what we write about, to gain an objective perspective on the personal and perhaps leave something more than a factual list of events behind on the written page. The final area she explores deals with what the writer does with the work he has created. She discusses archiving and indexing as a way to organize and store content for future writing projects and explores the potential for using the raw material of journals for publishing memoirs, stories and novels. A good guide for writing, but I would not say this would be my first choice for the reader who is just beginning journaling. I did not realize that the author had a previous work, titled “The Hidden Pen”, which might be a better starting point as she is an excellent writer. I suppose I started reading this expecting that I would learn better how to tell stories in my own journal, which for the past few years I've kept more frequently than ever before. That is not this book's goal. Instead, think of it as a writer's resource: How can you plumb the depths of your own (or others') journals for writing fragments, sources, memories, senses? And how can those things find their way into your writing, whether as memoir, poetry, short stories, creative nonfiction? Where are I suppose I started reading this expecting that I would learn better how to tell stories in my own journal, which for the past few years I've kept more frequently than ever before. That is not this book's goal. Instead, think of it as a writer's resource: How can you plumb the depths of your own (or others') journals for writing fragments, sources, memories, senses? And how can those things find their way into your writing, whether as memoir, poetry, short stories, creative nonfiction? Where are there connections and themes in your life? How can you discover yourself in a way that can best be written about? I will say that this is one of the most unique books-about-writing that I've read. It's also the one that has unblocked my own journaling, helping me to see beyond the factual record and whining about the things I desire but am not near, helping me to see the self that's under those themes and living more than those limitations might suggest. The author asked people who they most wished had kept a journal. Their answers were always that a relative or a parent they never knew. In the 1600's Quakers kept journals as a record of conscience. Journals sharpen conscience, not ego. People who blab don't keep journals. Their mindless chatter in my ears becomes their journal. Recording life in a journal inspires some to lead an interesting life so they have something interesting to record. Seeking privacy, women in Hunan Province in China write in a secret diary language called Nushu. If you have been "hit and miss" as a journal writer and are embarrassed by the thought of someone reading one of your journals, this book is for you. Sure, you use your journal to vent, to complain and to let your true self show . . . to yourself. I've always thought I would re-read mine someday and burn the pages. This book advises against that. Johnson suggests curling up with your journals on some rainy day and reading them, looking for patterns, for lessons learned. Transcribe them and try t If you have been "hit and miss" as a journal writer and are embarrassed by the thought of someone reading one of your journals, this book is for you. Sure, you use your journal to vent, to complain and to let your true self show . . . to yourself. I've always thought I would re-read mine someday and burn the pages. This book advises against that. Johnson suggests curling up with your journals on some rainy day and reading them, looking for patterns, for lessons learned. Transcribe them and try to establish a creative narrative, the same kind of narrative present in most works of fiction. This is a surprisingly engaging and informative little book about why and how of journals. I picked it up on a whim, more for reading about the "who and why" than the "how to." There's loads of fascinating trivia tucked here and there about such things as how early Quakers used journals as a spiritual practice of conscience and that there is a writing system known only by women in a region of southern China for their diary-keeping. One could read it either as a more academic look at journals or This is a surprisingly engaging and informative little book about why and how of journals. I picked it up on a whim, more for reading about the "who and why" than the "how to." There's loads of fascinating trivia tucked here and there about such things as how early Quakers used journals as a spiritual practice of conscience and that there is a writing system known only by women in a region of southern China for their diary-keeping. One could read it either as a more academic look at journals or as inspiration for keeping any kind of journal -- personal, professional, travel, art, writing, etc. Recommends it for: anyone who wants to journal or likes to already! Recommended to Samantha by: Amanda C.
(On Keeping a Journal)- The Art of Transforming a Life into Stories. This book is fascinating! Anyone thinking of starting a journal or learning how to maintain one will really enjoy this book. Alexandra weaves "real-life" journal entries and examples throughout this book which is my favorite part! It almost feels historical in a sense. She is definitely an artist with words- simply beautiful. At the end of each chapter, she included "exercises and journal prompts", a great way to get you starte (On Keeping a Journal)- The Art of Transforming a Life into Stories. This book is fascinating! Anyone thinking of starting a journal or learning how to maintain one will really enjoy this book. Alexandra weaves "real-life" journal entries and examples throughout this book which is my favorite part! It almost feels historical in a sense. She is definitely an artist with words- simply beautiful. At the end of each chapter, she included "exercises and journal prompts", a great way to get you started on the techniques she mentions throughout the book. There were a few things that I didn't quite follow/understand/grasp but that's probably just because I read it too quickly... or find it hard to think that way... maybe I'm just uncreative in those areas of thought patterns... anyway, I did thoroughly enjoy the book and would highly recommend it to any of you journalers out there!